Report by Paul Hunt, Coventry City Assistant Branch Secretary. Around 600 delegates gathered for a special conference of Unison to discuss the outcome of the 2014 pay campaign. This was only the 2nd time in the history of the union that a special conference had taken place – branches representing over 20 per cent of the membership in local government had called for the conference to discuss what was perceived by many to have been a disappointing end to the pay dispute which ended with the calling off of strike action in October last year. Coventry branch was proud to support this conference as it is vital that branches and members from across the union can come together to discuss the way forward on pay and other issues. Your delegates from Coventry were Dawn Palmer-Ward (corporate rep), Emma Smith (steward in Environment and Housing Enforcement) and Paul Hunt (steward in Revenues and Benefits). In addition a number of branch officers attended as visitors. At the conference itself the debate essentially centred around two things, on the one hand a motion (from the leadership) that pretty much sought to absolve themselves of any responsibility for the situation that took place where we ended up calling off strike action in October for an offer that wasn’t even an offer (it was a proposal, and an indecent proposal at that). It was pointed out to the leadership that suspending a strike on the basis of a non-offer was in fact against the union’s own rules. On the other side motions were tabled that looked at drawing out the lessons of what happened. This included holding the leadership to account, improving ways of consulting with members and the need for the union to really start opposing austerity. Also the need to have pay campaigns that more forcefully pursue our claim (rather than extremely isolated single days of industrial action with seemingly no strategy) and can start reversing the trend that has seen the real value of wages fall by around 20 per cent in the last 5 years. – Unless we fight we will definitely lose. 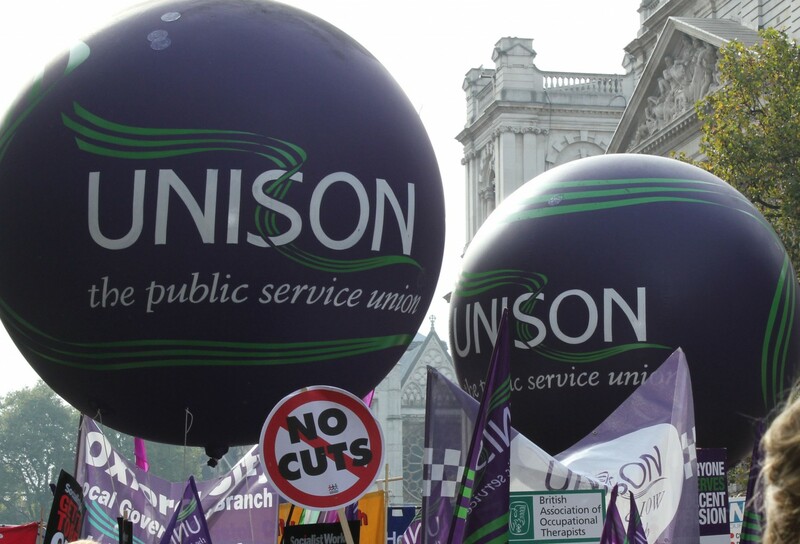 – The interests of Unison members need to come first. This was in reference to the clear evidence (in the form of a letter from the LGA to the general secretary of Unison, if you would like to see a copy let us know) that sections of the leadership had been doing some backroom dealing with the Labour Party leadership of the Local Government Association (our employers) with regard to the pay claim to ensure there are no disputes during the run up to the election or after May so as not to embarrass Ed Miliband. Delegates were very angry about this to say the least. – The leadership should stop blaming members for the collapse of the pay campaign and take some responsibility. When it came to the vote on the key motion, it was passed. Conference voted that there will be ‘lay representation’ (i.e. people elected from the membership, rather than just paid employees of Unison) in any future negotiations with the employer, that more thorough ways of consulting members will be used (including use of electronic methods) and crucially that Unison would look to put in a supplementary pay claim for 2015/16 (the one accepted was for 2 years 2014-16). This is a summary of what happened but what can be concluded is that the conference was a serious step forward in holding people to account over what happened in the Autumn and it showed the best of Unison – with likeminded branches (including Coventry) coming together to effect a change in direction of the union. Unison has massive potential and it is time we started using this potential before even more jobs go and our standard of living decreases further. If anyone would like any further information please do not hesitate to get in touch. Unison Elections – Use your Vote!